Search ‘De Pijp’ in Google and you’ll get a host of quintessential guides to where to go, what to do, and where to eat in De Pijp. A neighbourhood in the south of Amsterdam, just outside the main canal-packed Centrum district, De Pijp is packed full of trendy restaurants, bars, and cafés along each of its narrow streets (the ‘pipes’ of the area’s name). A multicultural district, it’s also only a 10-minute walk from the Rijksmuseum/Museumplein. Though I’m by no means an expert in this area (if you’re really planning on making a visit, definitely check out the wealth of other guides available online), here are a few first-hand picks of what to check out. Though comparable to Leiden’s own market, this one is far larger, having 260 stands that are open six days a week. It’s been open since 1905 and has since become a staple for the area, and for any visitors to Amsterdam. Wander all the way down Albert Cuypstraat to see all the stalls, selling everything from shoes to cheese (and make sure to get a fresh stroopwafel, too). De Pijp seems to be the area for Instagram-hyped cafes, and Café Blond is certainly one of them – i.e. it’s worth going for pictures alone. The interior is perhaps a little too twee and kitsch for some tastes, one wall being filled with a variety of decorated plates withidioms that range from the silly (“Have an egg-cellent day!”) to the downright sickly (I love hashtags because they look like waffles.”), but the pink couches and neon signs give the place a 50’s American-diner feel too. They serve a range of healthy but filling breakfast and afternoon tea options; we went for the ‘Cereal Killer!’ yoghurt bowl, which was actually served in an enormous coffee mug (get your Instagram at the ready!). A coffee is only €2.50 and cakes range from €3.50-€6 (for their special pink velvet cake), so it’s also a good option if you find yourself in the area and what a snack-break with a difference. This hip restaurant does exactly what it says on the tin, to be cliché – it serves unhealthy junk food but the twist is that everything on the menu, from the cheese and shwarma to the pesto on their pizzas, is entirely plant-based. Now, I’m not vegan (because cheese exists), but I am veggie, and visited with a lactose-intolerant meat-eater, so Vegan Junk Food Bar seemed like the ideal place to it – and it was. We ordered the pizza, Sumo burger (essentially a double-cheeseburger), and the loaded fries (aka a kapsalon, Dutch takeout delicacy). Though the pizza was perhaps overkill on our part (and not as tasty as the burger or fries), everything did look just like the real, meaty thing, and tasted just as good too. At 5pm on a Tuesday it was also really easy to get a seat, but by 5:45 people had to wait at the bar until a table freed up, and when we asked the waitress if this was normal she told us that this was not as busy as normal. So, heads up, get there early. There’s plenty more to do in De Pijp though – the Heineken Experience is just around the corner from the Vegan Junk Food Bar, and there’s also a ton of other highly rated cafes in the area, including CT Coffee and Coconuts and Scandinavian Embassy. There’s also a beautifully designed park and a 23rd-floor cocktail bar for any international students from big cities missing the urban life while in Leiden. 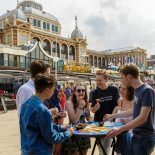 This entry was posted on December 8, 2017 by Abigail@TheLeidener in Culture, Living in Holland, Travel and tagged Amsterdam, amsterdam travel, de pijp, food, foodie, international student, leiden, leiden university, Student, student food, travel, vegan.